Bill Boushka: Craigslist attracts attention for its laid back use of technology and "business model"; is this like mine? Craigslist attracts attention for its laid back use of technology and "business model"; is this like mine? The Sept. 2009 “orange” Wired Magazine issue has a cute story by Gary Wolf on p. 98, “The Tragedy of Craigslist.” The online ver sion’s title is even less flattering, and you can look it up here. What’s interesting to me is that I likewise kept my technology “simple” and, as a proprietorship, did not have to worry about ROE or fiduciary responsibility to owners. The long Wired article makes it appear that Newmark would be a difficult business partner for this reason, and I suppose this is a good lesson for me to ponder, in advance, as I have some similarities in this area. Wikipedia attribution link for p.d. 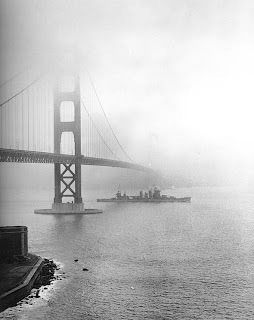 WWII era p icture of San Francisco Bay.